@ Conway Hall, Red Lion Square, Holborn [e-mail for details if needed] please arrive for 6.30pm prompt. to talk about the FBU campaign against the threatened closure of 17 London Fire Stations and other cuts and safety matters. to talk about the importance of the not-for-profit sector in London and the effects of the cuts to services such as ours. to talk about the impact of budget cuts on HSE services in London. would like ideas from all our supporters about how best to move towards financial stability. Nomination forms have been posted out – if you did not receive one please consider affiliating!!!! then getting your branch to nominate you. We need your active support!!!! www.lhc.org.ukLondon Hazards has been commissioned by London Councils to work in all London boroughs to: Improve Health and safety in the workplace and communities through information, advice and training, focusing on women, black, Asian, minority ethnic communities and trade unions. 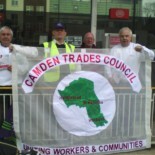 This entry was posted on November 20, 2012 by CAMDEN TRADES COUNCIL.